Find a Chase bank. Tell them your father works for Chase. There are narratives in conceptual art we just stop moving for. We find ourselves swiftly engaged. This is what I felt when I saw Sara Shaoul's "Chase Manhattan Plaza" installation which was her thesis project for Hunter's MFA program. I was fascinated by her ability to successfully tell her story in a clear and honest uncomplicated site-specific composition. She makes us think about family, immigration, the banking debacle, paradoxes and contradictions; all presented in a new voice, which we couldn't have imagined since we have no reference point to see it from a multi-dimensional perspective, like this anyway. 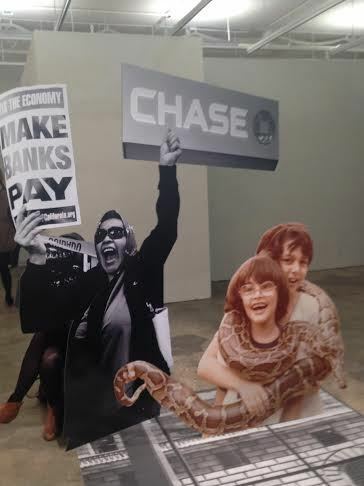 Artist Sara Shaoul compels us to see where a bank, specifically Chase, was an influence for good at its zenith in her young life, later collapsing into the reality of public disgrace. She shows the two sides of her story as a child born to immigrant parents who were able to achieve middle class comfort and prosperity; giving their children opportunities to not only thrive but be well taken care of via the Chase nuclear engine -- including all manner of health insurance and company picnics. But then time happened and banks who watched over families whom they represented evolved from fortresses of security to machines serving their own interest hence the OWS movement. A cause and effect of magnificent proportions hurling Americans into much harder lives. This is where her truth without judgment blossoms. If I would have never had a connection with Chase as a child I would have such a different narrative about that bank now. I want to show how complicated the fall from grace from institutions are for individuals. During the work on the installation, people with similar stories came up to Shaoul to share their experiences. I have a friend who comes from a third generation Chrysler-family from Detroit. They used to have Lee Iacocca portraits in their living room, that kind of life... Until it fell apart. And then somebody else talked to me about coming from a family where his father was a policeman. And what the police meant for him as a child versus as an adult. There is this incredible disparity between the childhood narrative and the adult perception of that institution of power. There are just so many personal narratives that intercept with the arch of the institution. 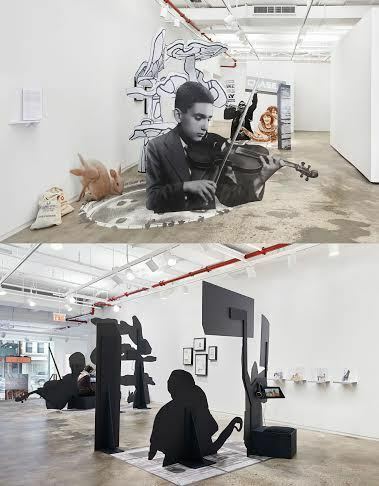 For her Chase Manhattan Plaza installation, Shaoul came up with several tableaux, each with a different theme, for example: immigration, the corporate space, her own childhood. She even writes a fictional kind of teenage breakup letter with the corporation. "I thought that I worked for them. We were Chase kids, at school, people knew what company your dad worked for." It was disarming when she was no longer welcome to the Chase fortress after he retired and she was doing the research for this project. In Singapore, if people got in trouble, if a kid got caught smoking pot, his entire family was deported within 48 hours. And that meant fathers were losing their jobs. Families were shamed. That idea was so frightening to me I never misbehaved. We felt that we were representing my dad to a certain extent. ShaouI wanted to channel the experience of being disillusioned into a way that mirrors what a lot of people have felt about banks during the financial crisis in her letter. I trusted you and you let me down. I put all my money in your bank. I trusted you with this mortgage and you f*cked me over. What I'm expressing, is realizing when you grow up that the company whom you thought cared about you was just a company. And your father was just an employee. That's just how business is. Obviously there's a different disappointment when your life has been ravaged because of the financial institutions being unethical. But I was creating a connection. It came out in one swoop and it felt authentic. Looking back I can't believe my life was really ruled by a bank. I didn't know anything different. It was what the bank meant to her personally and what the banks became globally which pump helium into her installation -- giving it flight. Ultimately Ms. Shaoul gives us a visual novella -- a very personal look into her paradox that frames the point view of the paradoxes that frame all our lives.